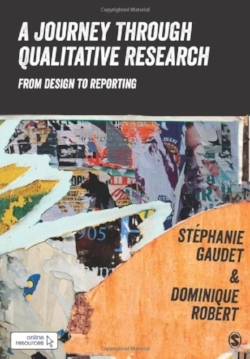 Dominique Robert (Associate Professor), along with colleague Stéphanie Gaudet from the School of Sociological and Anthropological Studies, have published the book A Journey Through Qualitative Research From Design to Reporting. To get a copy of the book, please visit SAGE Publishing. A Journey Through Qualitative Research takes students from start-to-finish through the research process while showcasing the complexities and interrelationships of different methods, schools of thought, and associated analytical strategies. Encouraging students to think of qualitative research as a flexible, cyclical process rather than a linear one, this book offers a panoramic strategy and dynamic approach to qualitative research that accommodates the fluid nature of research and accounts for lessons learned through lived experience. With an emphasis on the analysis stage—within cases, across cases, and the dialogue between these insights and existing literature—it uses concrete applications to show how methodological decisions translate into practice. Through a conversational tone that unpacks key vocabulary and acts as a companion supervisor, this book equips readers to traverse every step of the qualitative research journey.